Build an empire and conquer the land in around eight minutes! In Eight-Minute Empire, 2-5 players take turns selecting a card from six displayed. The card gives a good, and also has an action that the player takes immediately. Actions help players take over the map, but sets of goods are worth points at the end of the game, so players have to balance the two aspects. 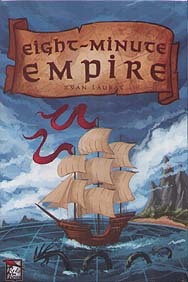 Eight-Minute Empire is the super-quick area control game with tough decisions. It's easy to learn and perfect for when you only have a few minutes. A simple and fantastic introduction to area control. I played this one a few times over Christmas as a friend received it as a present and I was very impressed. It is nice and simple and although it doesn't really play in 8 minutes, it was only taking around 20 minutes a game once we knew what we are doing, and it packs a lot of punch in that time. Players are competing to score points in 3 different ways: by having majority in a region, by having majority of regions in a continent, and by collecting sets of cards that give points. Players will be purchasing cards in the display row, which allow them to perform actions on the board. Actions can be: putting more units (cubes) onto a region, moving units into other regions, moving units overseas to other continents, or eliminating an opponents unit. All of this helps players plan and execute their strategy for point scoring areas. The cards also have a dual purpose in that they will be part of a suit that if collected can offer more points at the end of the game. There are only 8 rounds with only 1 card purchased each round and money is tight in the game so players will have to be careful which cards they buy, as there is only so much they can do! I found the gameplay quick whilst also giving a good depth of decision making and strategy - do I want to focus on getting more units on the board or moving them further afield? Do I want to try and get them overseas, and then build a city (which acts as another spawn point for units when adding to the board)? I found the game very well designed and illustrated, components could be a little better, but as an abstract area control game, this one is first class and my non-gamer friend is thoroughly enjoying his Christmas present!